The residence located at 235 North Lakeview Avenue in the Bumby subdivision of Winter Garden Florida. Constructed around 1938, platted by Henry "Harry" Edward Bumby (1870-1941) in 1923, this building a classic example of the Tudor Revival-style of architecture. The home is usually associated with Harold E. Hall and Gladys Hall. Hall was in the citrus business and established the Hall Fertilizer Company, which later became Diamond R. The Orlando contractor, W. P. Murdock, who built this house, also built additional homes in Winter Garden prior to World War II. Jim Cloughy, who worked as an accountant for R. D. Keene, lived with his wife and family in this home later. This is one of the few homes in the area with a basement. Original color digital image by Katherine Bowers, July 2014: Winter Garden Heritage Foundation, Winter Garden, Florida. Digital reproduction of original color digital image, July 2014. Winter Garden Heritage Foundation, Winter Garden, Florida. Winter Garden Collection, RICHES of Central Florida. Originally created by Katherine Bowers. Copyright to this resource is held by the Winter Garden Heritage Foundation and is provided here by RICHES of Central Florida for educational purposes only. Cappleman, Kay, and Rod Reeves. Sundays in the South: Touring West Orange County. Winter Garden, FL: Winter Garden Heritage Foundation, 2009. "Welcome." City of Winter Garden. http://www.cwgdn.com/. Bowers, Katherine. 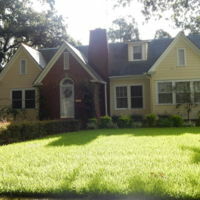 “Home of Harold E. and Gladys Hall.” RICHES of Central Florida accessed April 20, 2019, https://richesmi.cah.ucf.edu/omeka/items/show/4172.